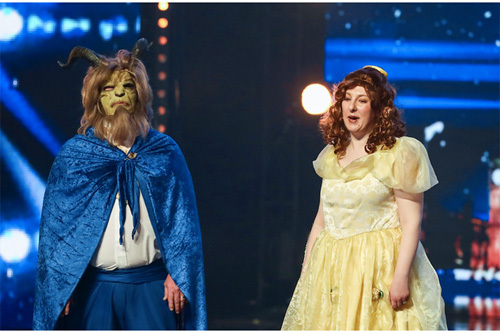 Kath and Joe from episode 5 or Britains Got Talent aka 'Beauty and The Beast' We dress up as various princesses and Characters and perform and entertain. They like to put a smile on peoples faces and are also up for a laugh. After performing in front of the celebrity judges on Britains got talent they got a standing ovation and a fantastic crowd reaction. They have over 7000,000 views on youtube in the uk, over 4000 likes and several million views more worldwide. There in full costume' and Katherine will also be performing some solo songs from Various Disney Films.